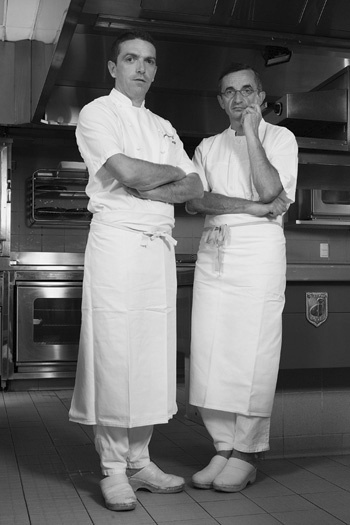 This is the portrait of Michel and Sebastien Bras (Laguiole). It was commissioned by Next (the saturday extra of the Liberation Newspaper in France). I’ve done the portraits of 11 famous cooks, the best cooks of the country, la creme de la creme. I loved some of these meetings. I’ve been always fascinated by this french ideal around Cooking. Actually, I had a doubt about the idea of beeing a painter when I was 22. Reading Gilles Deleuze, the french philosopher, and his theory about Desir, I started to feel that learning to be a painter could not come only from painting, its history and technic. It could and it had to come from a much larger field of experimentation. Look at Rembrandt! Look at Gauguin! Is painting only based on painting?! Cooking became one of these fundamental inspirations for me. Thinking that a good artist should be able to make a good Mayonnaise, for sure! It’s all about that actually. The best Cooks are artists (Look at Michel Bras cutting the meat, it’s very close to Fontana cutting a canvas, seriously! ), and it definitively makes sense when one imagine the diversity of their influences and the enormous field of experiences around this.